The Payment Card Industry Data Security Standard (PCI DSS) is an information security standard for organizations that store or process any of the following credit cards: American Express, Discover, JCB, MasterCard, and Visa. PCI DSS compliance is mandated by these card brands and steep fines can result for non-compliance. Depending on the circumstances, non-compliant merchants may have to pay anywhere from $5,000 to $100,000 every month until all compliance issues are addressed. To achieve PCI DSS compliance, an organization must meet all applicable PCI DSS requirements. Technology and business operations inherently change over time. Thus, PCI DSS compliance is a continuous process. This process starts with assessing the current environment against the PCI DSS requirements. From the initial assessment, there will invariably be items needing to be added/changed/removed within the cardholder data environment (CDE) to enhance security and bring the organization closer into alignment with PCI DSS. Before Partners in Regulatory Compliance (PIRC) performs an assessment with your organization, we’ll consult with you to determine which Self-Assessment Questionnaire (SAQ) type applies to you. 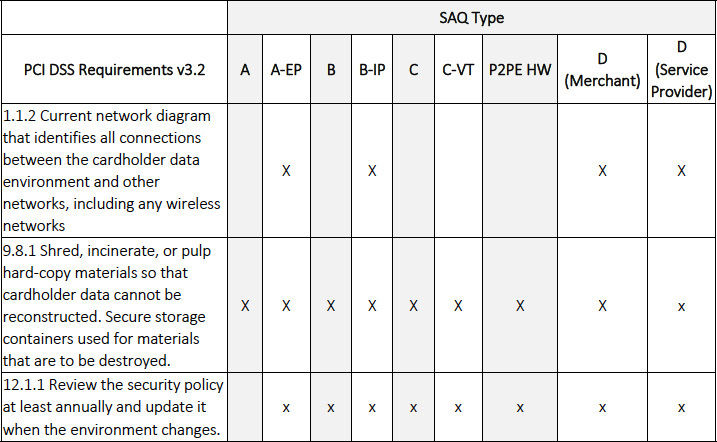 The applicable SAQ type depends on your environment such as if you have a telephone-only point-of-sale terminal, if your CDE involves an IP-based network, if you have eCommerce as part of the mix, and so forth. The abbreviated table below illustrates this concept. “X” means “applies to”. There are 12 main PCI requirements with sub-requirements in each section. The applicability of each main and sub-requirement will depend on the SAQ type your organization must fill out each year. Use and regularly update antivirus software. In addition to the SAQ types, it is important to know what merchant level applies to your organization. There are four merchant levels. Each level has different requirements as defined below.